For the 3OH!3 and Outasight concert last week, I couldn't figure out what the h I wanted to wear, until I saw my "Ke$ha earrings." They're super long, colorful feathers that I got to dress up as her one night. I thought I'd never wear them again, but then I kinda started to love them. All I needed was a reason to stick those suckers in the holes. With inspiration from the leopard print in the feathers, I paired my super old snakeskin heels with mint jeans to match the pretty blue feather. The hardest thing for me when getting dressed is just finding a little inspiration. If I don't find something on Pinterest that I want to use or one article I love, I stare blankly at my drawers hoping for something to jump on me. 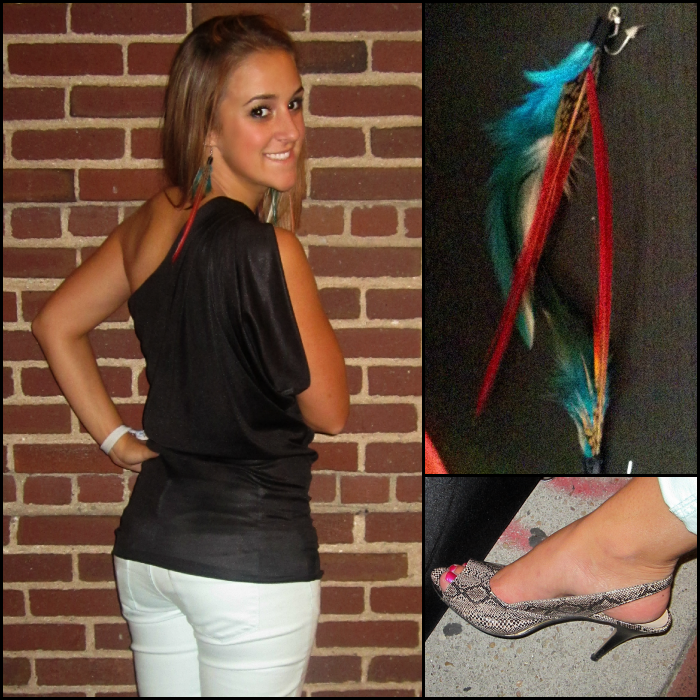 Thank goodness I spotted these feathers so I could feel slightly rocker-ish [okay, maybe not really], but still totally me.